First, we’ve talked to scores of product engineers over the years who’ve put long hours of soul-searching and number-crunching into finding the perfect combination of mechanical transfer system, gearing ratios, and even details like saw blade/drill specs to come up with the right balance of power, utility, and battery life to make a tool useful. And we fully believe in the importance of this task. Seriously, if you’ve ever wondered why one cordless drill, saw, or whatever just seems to work night-and-day better than another, you want to look to this balance for the answer. So the idea of using the same motor and battery assembly for every tool gives us pause. If Black & Decker optimized it for the drill, will it make a poor saw? Or jigsaw? Even if they change the gearing — and it does appear that the gearbox is included in the accessory rather than the power unit — how much utility will we lose over a properly-matched motor power curve and gearbox? Looking quickly at the specs, it seems to us that B&D cut the middle. It’s a single-speed drill/driver, running at 0-800 RPM. Homeowners (likely the prime target for this product) probably won’t live and die for that high-speed (up to 1,500-2,000 RPM) setting. But anyone working in steel, for example, will lament not having it. Next, we’re a bit concerned with ergonomics. As a drill, the Matrix is a little chunky for its size and power, but it doesn’t look too bad. But stick a trim saw on the end of it, and it looks wonky as hell. It also doesn’t look like it’ll make a very comfortable jigsaw or oscillating tool, especially for anyone who’s used the standard (or standard cordless) versions of those tools. But let’s not skip out on the pluses of this new system, either: it’s based on the new 20V battery platform. While the batteries certainly won’t be interchangeable, the cells themselves are likely similar to those you’ll find in DeWalt, Porter*Cable, and other Stanley Black & Decker brands. That’s a good thing. The new batteries represent a pretty significant jump over previous Black & Decker battery quality. At least in drill/driver form, the B&D looks a lot more comfortable to hold than previous models. Actually, it seems inspired quite a bit by the DeWalt and Porter*Cable models, which is also a good thing. Let’s assume that B&D imagines this as a homeowner solution — a tool for those folks who do a project from time to time, but who don’t need a full-on kit of tools. That kind of makes sense, at least until you look at the pricing. The drill/driver itself MSRPs for $70, which isn’t bad for a half-decent li-ion drill. Attachments, however, run $30/$40 each, so by the time you’ve built up a four or five piece kit, you’re pushing $200 — which is in range of the venerable Ryobi 18V One+ li-ion combo kit. Then again, you’re looking at different tools. Most combo kits, like the Ryobi, are going to give you a trim saw, drill, and maybe an impact driver. While Ryobi does offer a One+ jigsaw, it’s of the old style and runs around $90. So if you were trying to built a kit of, say, a trim saw, jig saw, sander, router, and drill, the Matrix system is pretty much the only way you’ll do it for this price. Or, you could just buy a good cordless drill and spring for a cheap corded jigsaw, a cheap (but decent, as they’re available cheap) corded trim saw, and a nice palm router — which might prove a better all-round solution. Anyway, they’re all available now online and in some stores, though the online offerings look a bit spotty. Watch out for those folks asking significantly more than retail. Someone bought the tool and attachments from Canadian Tire and had a lot to say about them (some good, some bad). Here’s the summary: The Matrix is a good drill and impact driver, but it’s poorly balanced and “tail heavy” when it’s sander, jigsaw, and trim saw. In the case of the sander and jigsaw attachments, the awkward ergonmics make it hard to closely follow the cut line. In the case of the trim saw, the poor balance is dangerous. The tail-heavy handle pulls the blade out of the wood and it’s not very safe to use. If you want to read more, just search for “Matrix” on the Canadian Tire website. As already said, this is likely to be promoted for the casual project builder and not tradespeople. However, for just casual use of any (or all) of these tools, I’d likely steer friends away if they rarely use any tools. I’d suggest corded tools for those folks – you can get a nice bunch of corded tools for the price and a casual user will not have a major issue of running a cord. I’m sure lots will disagree and that is cool since I appreciate opinions that may, and often have, enlightened me and changed my opinion. These are actually already available and have been since last October at Sears. B&D produced a Craftsman version that is identical in pretty much every spec and gave them 6 months exclusivity with the product before they released their own brand. I’ve tried the Craftsman 20v Bolt On in the store and it feels pretty good in the hand. The Bolt On system also, at least at present, has 2 more tools available than listed for the B&D system: a hammer drill and an inflator. Check them out the next time you’re in Sears. My store has a huge end cap devoted to the product and a demo station. This is not the first time B&D have tried this. My grandfather gave me a similar sort of set a bit over 20 years ago which was already pretty old then. It consisted of a drill body and several attachments. IIRC the drill was single speed. I forget how they attached exactly, it might have been with the chuck but I have a feeling it was removable. There was the keyed chuck for drilling, of course. There was a jigsaw head. The drill attached to a spindle on the back of the head and was held in place by a jubilee clip/hose clamp attached to the head by a support piece. There was a circular saw head. It had quite a small blade, 6″ maybe. There was also a good sized grinding wheel and cradle for the drill. Put the drill in the cradle, clamp it down and chuck the grinding wheel and you have a bench grinder. I’ve used all the attachments with some success. I have vague recollections of the jigsaw being frustrating and the circular saw being pretty useful. Probably used it as bench grinder most, for sharpening chisels. Haven’t used it all in ages but I do have the attachments packed away still, although I think the drill itself may have died. It was all painted blue except for the jigsaw head, which was polished metal. I have a sneaking feeling it might have been from the late 70s. I saw this new set in a store here in NZ and immediately thought of my old set. It really is exactly the same idea, just better integration of the fittings to the power unit. I think your article hit on it, ergonomics. Using the same handle for various tools just won’t work, at least with me. To me it is just a gimmick. Hey some of these brands have an idea already like Ryobi 18V and the Sears 19.2 volt lines which I have some of both. I think those ideas are best. Use the same battery system NiCd/Lion. If one breaks you still have the others where as in the system described in this article if the base breaks you are sol for all of your tools. Improve the tools you have for the same battery line is a better strategy in my opinion. Couldn’t agree with you more Russ. Them continuing to improve batteries, ergonomics and adding more tools has kept me using the craftsman C3 line of cordless tools for years now. No need for a frankendrill here. I own the 20V version of this, and have been using it this week to do the grunt work of renovations in my office. Over a span of a couple of hours I toggled back and forth between the drill head, the sander, the jig saw, and the rotary saw. All four handled all the tasks that I threw at them without any problems, and plenty of battery power left over at the end. I’ve read reviews that say this isn’t the tool for a professional contractor, but I can vouch for the fact that it suits a DIY homeowner just fine. One other note, I read a review that said the design of this unit, when using the trim saw attachment, creates balance issues and makes it dangerous to operate. I cut through about 12 feet of inch-thick particle board (having never used a power rotary saw ever before) and never once felt like I was out of control or a danger to myself or others. I have to agree with your comments. I have a wide variety of cordless tools, including Ryobi One +, Dewalt and Makita. I think the others are missing the point. This is a compact and easily transportable collection of power tools (I have all of them). I carry the set in the trunk of my car at all times, and you’d hardly know it was there. Try doing that with individual power tools! Horses for courses I say. It does what it was designed to do perfectly! If I want to do a lot of work with a circular saw than I use a dedicated tool. The B&D has ample power and gets the job done! For my money this was a great investment and I don’t regret it for a moment. I bought this at Christmas. I wanted the 20v power as I have had many cordless drills and none of the suited my needs. I got the drill and impact driver in one box for 99 bucks and let me tell you, as a drill and driver, this tool rocks. It is well balanced and not heavy at all. Plus, I have only charged it once since I got it in December. I use it at least 3 days a week for at least an hour and it never really went dead on me. As for the other attachments, I really dont know about a jig saw or router or anything else coming out of this pistol grip design. I think they would be awkward to use. Now if only this battery were able to be used in other B&D products (I’d like to get a cordless nail gun but no way am I spending 300 bucks on one) we would have a great product. I personally really like the Matrix set up. No, it won’t replace a table saw, or a corded reciprocating saw, but it wasn’t meant to. I use the matrix around the farm, and recently took off the roof to the chicken coop, and laid all new rafters, and plywood surface. I didn’t want to drag a cord up on the roof, and the matrix was perfect for that. I used the jigsaw to cut more intricate pieces that was needed in edges (the dust did block the chalk lines, but I just blew on it to continue). In the house, I sanded down our hardwood floors, and in the corners I used the sanding attachment. To state it bluntly; It is great for when a cord would be cumbersome. I have placed a set of the Matrix tools in each of my “punch list” trucks. They have worked will in this type of use. There was a time when we would be amused at the site of B&D tools on the construction site. However, the Matrix sets have pro-formed as well as any other brand with this type of use. I would recommend this B&D tool set for professionals or non-Professionals use with out hesitation. I am an OTR trucker and this set is invaluable to me. I need the attachments and no cords. I am not a professional tradesman by any means, but for what I do, this set has everything. I use the drill the most, but the impact is second, followed by the circular saw, and the reciprocal saw. I seldom use the sander, but its a heck of a lot better than lugging all of these power tools around and stringing up cords across a parking lot. Plus its compact. I have an older set that was made just before this one and it works great except the 14.4 volt battery doesn’t last more than about 6 months. I am going to try refrigerating the lithium battery on this Matrix set and see if the battery life is better. I do get all of the concerns about the weight of the handle and the same gears for all the different tools, along with the comparison to professional grade tools. Lets face it, this is not for a carpenter building homes for a living. But for someone who needs a variety of tools with limited space and only uses them once in awhile with limited access to household plugs, this set is great! I don’t know how many people are in my same situation as I can’t imagine there are too many, but thanks Black and Decker for making this set. It has served me well. I was handed this Matrix when my battery died out on my 20volt dewalt. WITH A DEADLINE I LOOKED AT THIS TOOL WITH DISGUST.It sure proved me wrong ,I hung 4 doors, cut plenty trim and put up new blinds!! All done within my deadline. I would keep one around the house anyday. Good job B@D. GUESS I NEED TO NOT BE SO CLOSE MINDED. I LIKE IT. Hi to all, this critic is very unfair for the matrix. First of all we try a tool and then judge it. I have a european version of this (18V) with all the available attachments. I did a lot of jobs since i got them at home like building a shed, removing the plaster and stone from a concrete shed, drilled, cut and all this stuff with the matrix. I was amazed with the ease of use and the flexibility of the system. I have a corded version of the matrix also and combined with the cordless they proved all the judges wrong…..Good for you B&D…. About a week ago I got a “box set” which included the 18V handle (they don’t do a 20V here in New Zealand) with two batteries and a charger plus six attachments: the drill/driver, jig saw, trim saw, oscillating multitool, sander, and inflator, all for NZ$299. I then bought the impact driver attachment separately for another $60. After playing with everything for an hour or so, this last weekend I laid new decking surface on two decks and I used the trim saw for cutting the timber, then I pre-drilled it and screwed it down. I also replaced some lose nails with roofing screws on a section of the corrugated coloursteel roof. Now, if I built decks or installed roofs for a living I can image there would be heavier duty specialised tools I would buy, but for a home handyman like me the Matrix performed brilliantly. I’d have no problems recommending it. 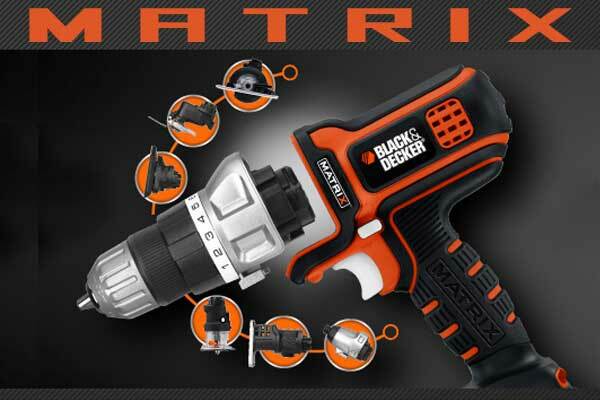 I got a sears version of the black/decker matrix for Christmas.Just curious. Now I have a weed Wacker that uses the 20v lithium battery and has a different charger. Can I charge or use the sears battery in the weed Wacker? And can I use the sears charger on the b/d battery? This set is NOT a poor choice for a DIYer on a budget. I suspect that writer doesn’t own one. I have worked with power tools for 40+ years. I have had a Craftsman C3 19.2 set – several tools, but I own a Motor Home, and wanted something smaller so I bought the B&D Matrix system (all but the Sears hedge trimmer and air attachments). I have been quite surprised! It performs beyond expectations so much so that with my home remodel these systems sit side-by-side. I prepped electrical, doors, and several other tasks with the Matrix. 2 of my married children have also bought into it. Oh, I picked up a B&D Weed line trimmer, and the Sears and B&D Batteries work fine; they’re the same. “Tool” is clearly the operative word in “toolmonger” here. People look for reviews online for actual reviews, not an opinion page of your excuses for NOT reviewing the thing. Information age, my patootie. Thanks for nothing. These ROCK. I have just about all the attachments now and every one works great. Get the 4AH battery (search around – they are available) with twice the runtime and even the pole saw has plenty of power. Get the quick charger and the charge time goes down to less than an hour. I thought the frankendrill issue would be a problem with the recip saw but I actually like the form factor BETTER than my big Milwaukee. GREAT TOOL! The circular saw is fabulous. The inflator (actually a Sears Bolt-On tool) fills a car tire in just a few minutes. We need MORE ATTACHMENTS. The reviewers totally has his head where the sun don’t shine. He did not realize you could put a GEARBOX on a motor and change the speed. 100% agree! I have both the 18 volt version and the 9 volt version for the car with all the attachments I could lay my hands on. Absolutely brilliant in all respects. I am listening to how good and/or bad the Matrix system is and as far as I am concerned, I like it. True I am not a contractor, just a DIYer that has been the Tool department’s manager at HD and Lowes. This was never meant to be of the highest quality. You get what you paid for. I have used the drill, trim saw, sander, circular saw over the years and I like that feature. I am now going to buy the jigsaw because my old P/C gave up the ghost. The average person doing diy would not have any problem using the system. But I do suggest buying another battery. I have been in the middle of sawing a sheet of OSB when it stopped and needed recharging. If I invest into this set of tools, instead of getting a second battery, I would consider getting a corded Matrix for those task that use up the power the most. Beside, with a second body, you don’t waste your time changing bits and drivers.